The coloured is name all of heavy metals usually, except for iron, manganese and chrome. Their main representatives are a copper, lead and zinc. Copper native. Glance (glitter, glare) metallic, opaque. 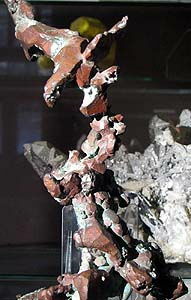 Colors copper-red with brown oxide tint of mineral often covered green triturate crusts. A line is copper-coloured. Fracture, break hooked. Very forging. Cleavage non-existent. 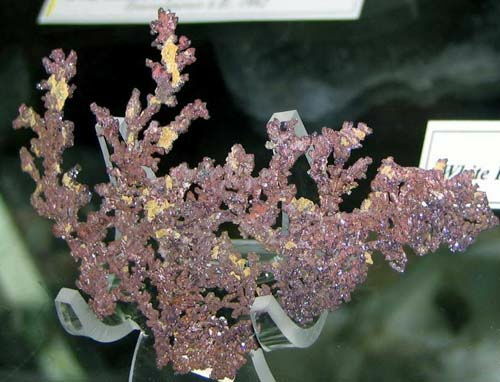 Be found in the area of oxidization of sulfide deposits of copper and in emptinesses of basaltic lavas. Crystals (cube Crystal structure) are usually strongly distorted, more frequent dendrites, dense tumours. Places of distribution: a district Overhead (USA), Zaire (Africa), Spain (EU), CIS. Chasty dendrites. Usually is dense the masses, but also accretions of dendritesой or wire form are very typical. 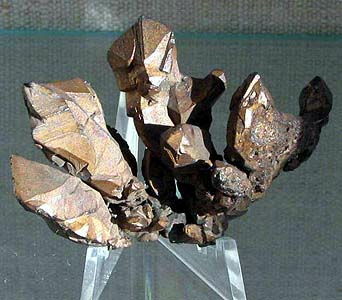 Crystals are extraordinarily rare in form cubes and octahedrons. A surface is mat, but when it is fresh, for it metallic brilliance and characteristic copper-red color. It is easily exposed to the changes. Copper (British Copper, French Cuivre, German Kupfer) - one of the first metals which a people began to apply for technical aims. Chemical composition (chemistry, compound). 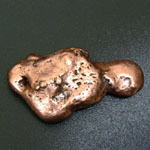 A native copper usually does not contain admixtures or contains the insignificant admixtures of silver, Bi, iron, sometimes a to 2-3% gold (as a sosoloid; goldish copper). Form of crystalline excretions. More frequent than all continuous the masses, dendrites, threadlike, moss-like, wire aggregates. Face-centered cubic lattice. Class of symmetry. Hexaoctahedral - m3m. Cleavage. Absents. 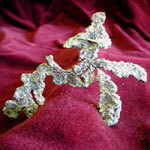 If there are doubts, they can be settled, acting on a standard an aquafortis and moistening solution a platinum wire. Under the action of flame it will be painted in an intensive green color. At addition of solution of ammonia it is painted in blue. Easily melt fuse and blacken. A behavior is in acids. Dissolves easily, at addition of ammonia solution is painted in a deep dark blue color. Deposit of minefield mine field occurrence subsoil copper bed in ultrabasic rocks, consisting of minerals, rich in iron and magnesium. 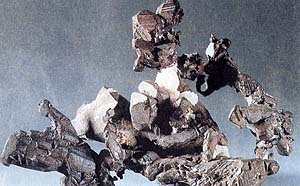 They appear also as a result of some chemical processes in sulfide deposits. Meet also in emptinesses of basalt ragstone and conglomerates. Deposit minefield mine and use. Beautiful crystals are known in the USA (lake Overhead, the states are Arizona and New Jersey), in Germany and Finland. A native copper does not present an industrial value. 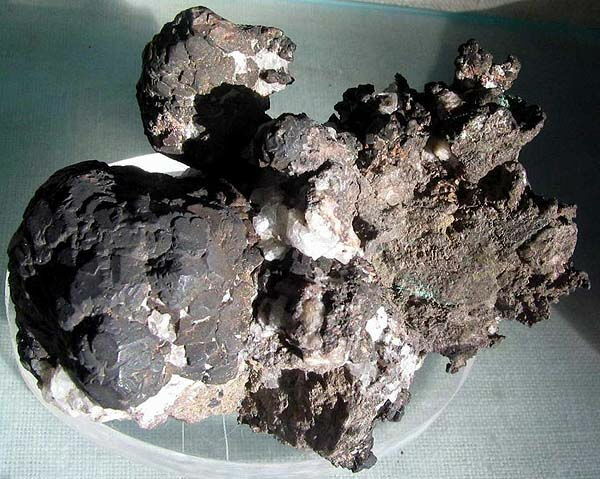 This metal, very important for an economy, is extracted from copper-bearing minerals. Copper. Kondopozhskiy area, Karelia, Russia. A photo: © A.A. Evseev. Copper. Kivino peninsula, lake Overhead, Michigan, USA. A photo: © A.A. Evseev. Copper. Rubik mine, Albania. ~8 sm. A photo: © A.A. Evseev. Copper. An island is Copper (Medniy), knight Commander lakes, Russia. About 10 sm. A photo: © A.A. Evseev. In an organism a copper participates in the process of breathing of tissues, in the processes of anabolism (synthesis of new structures and matters), synthesis of haemoglobin and other iron-porphyrinic, pigments of skin, hairs, eyes, influences on functioning of ductless glands. A to 95% copper, acting (in a stomach an amount of it is maximally), is absorbed in a gastroenteric highway, in a duodenum, emaciated and iliac bowel. A bivalent copper is better mastered. Copper gets to all cages, tissues and organs. The maximal concentration of copper is marked in a hepar, buds, brain, blood, however much it can find out a copper and in other organs and tissues. Copper plays an important role in the processes of biosynthesis of hema and, accordingly, haemoglobin. Therefore its insufficiency, similarly as well as gland, can result in anaemia. 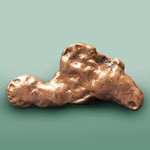 The deficit of copper can result in forming of aneurysm of aorta and vessels of cerebrum. For the same reason insufficiency of copper results in a deossification and osteoporosis. Copper participates in formation of myelinic shells of nerves (herpes, "insulators" of nerves and electric current, going to on by him) degeneration of which results in the dissipated sclerosis and other violations of the nervous system. 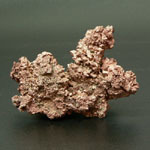 A cobalt (in moderate doses) is promoted by mastering of copper. A bivalent copper is better mastered. The table of contents of copper goes down at saccharine diabetes. Its maintenance goes down and at emotional stresses, psychasthenic, epilepsy, treatment of nervous and psychical diseases is therefore possible preparations and plants, containing a copper (psychiatry). The table of contents of copper rises at epilepsy, hepatitis, hepatocirrhosis, anaemias, leucosises and infectious diseases (scarlatina, diphtheria, tuberculosis, meningitis). There is dependence between the level of copper in blood and fervescence as a result of inflammation. On meaningfulness increase of maintenance of copper comparably with determination of erythrocyte sedimentation rate, ESR. Copper is needed: at a lipidemia, osteoporosis, anaemia, for strengthening of hairs, normal functioning of the nervous system and joints, at the diseases of lights, any inflammation, gangrene, saccharine diabetes and endarteritis. 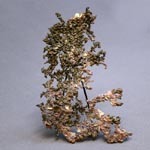 Copper can brake mastering of iron an organism, cobalt, zinc, molybdenum, vitamin of A. Oral contraceptive, hormonal facilities, preparations of Cortisonum are instrumental in the leadingout of copper from an organism. This microelement participates in forming of albumens of connecting tissues - collogen and elastin, which are the components of bone and cartilaginous tissues, skin, lights, walls of blood vessels. 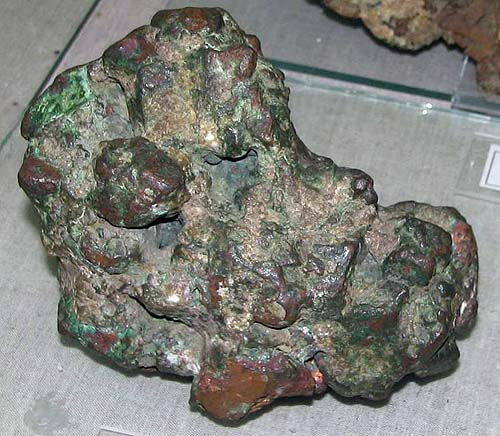 One of early signs of insufficiency of copper is an osteoporosis (a copper is played by a role in formation of collogen - from an albumen, formative bone tissues, skin and connecting tissues), graying canities and pelade (follicles). Insufficiency of copper can cause the delay of growth, anaemia, depigmentation of hairs (graying canities) and pelade, weakness, decline of respiratory function, appearance of skin ulcers, loss of appetite and decline of weight, atrophy of cardiac muscle, decline of haemoglobin and amount of red corpuscles. Displays of surplus of copper: functional disorders of the nervous system (worsening of memory, depression, insomnia); allergic dermatitis, allergodermia, atherosclerosis, violation of functions of hepar and buds, haemolysis of red corpuscles, haemoglobin in urine, anaemia, defeat of hepar with development of cirrhosis and second defeat of cerebrum (psychiatry - hallucination, delusion), related to the inherited (innate, DNA) violation of exchange of copper and albumens (illness of Vil'sona-konovalova - it is related to the accumulation of copper in a hepar and other tissues, "copper eye", border of pupil). The table of contents of copper in a hepar rises at a cirrhosis (serosal tissues), its high level is observed at a biliary cirrhosis and imperforation of bile-excreting biliary ways. Setting of chelating preparations, but not limitation of copper is recommended. The surplus consumption of copper results in the deposit of copper in cerebral tissues (intoxication of brain is psychiatry ), skin, hepar, pancreas and myocardium (electro-shock therapy). Risk of burns as a result of eating away of derma. Can stormily react between itself (components), with water and other matters. Matter, that spilled / scattered, can select a corrosive pair. Risk of burns. Risk of fire. Risk of explosion. If you called of the Internet search on these webpages on direct reference from the searching systems, and this material appeared for you too difficult, recommend the visit of a section "Catalogue of popular stone", where photo pictures over are brought and properties are accessible described more than 100 the most popular precious and carpentry stone and semiprecious stone and added them magic properties.